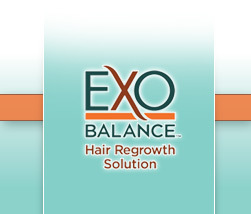 ExoBalance is a breakthrough treatment for men and women with hair loss. Developed after years of research, itâ€™s the first product to treat the underlying cause of all hair loss -- an imbalance of the scalp from a lack of circulation, flora, nutrients and moisture caused by environmental, chemical and hormonal attack. 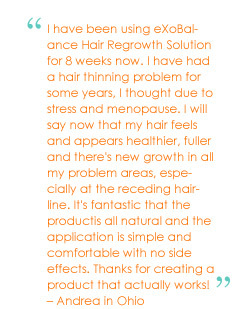 This unique solution helps to stop hair loss and create vital new growth without side effects. Formulated with Vitalisteâ„¢, a patent-pending blend of plant-based ingredients, ExoBalance helps restore the scalpâ€™s natural balance of circulation, flora, nutrients and moisture. ExoBalance utilizes naturally based technology to biologically reverse the hair loss cycle, bring back your hair, and make it thicker. 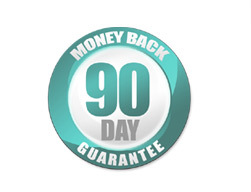 Results begin immediately, can often be seen after only 21 days, and continue to naturally and visibly improve. You have everything to gain -- including your hair!